Today, I’ll cover the fifth and last of the elements of need definition, ease of communication. Genius is the ability to make hard things appear easy to understand. Most of you reading this blog are probably familiar with the concept of an “elevator speech.” Basically this is a one- or two-sentence, well-practiced summary answer to the question, “What do you do for a living?” It’s a great tool for people who are seeking new employment. The idea is to compress the answer into about a minute, just as if you were on an elevator and asked what you do. If you are practiced with your elevator speech, you may make a huge impression on someone who could very well be your next employer. In fundraising, we have had to use this technique forever. 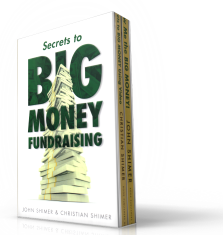 Fundraisers never know when someone will ask, “What are you working on now?” If we can answer in two or three sentences, then we have mastered the “easy to communicate” dimension of the need definition. When we find ourselves unable to do this, we have a real problem. You, too, must develop an elevator speech for your project. In that speech, your project’s need definition has to be presented in one sentence. Think about this! One little sentence to say it all! Can you do it? Just try doing it. Practice on people close to you. See if they get it. Then branch out and try it on others. If your elevator speech needs refining, then punch it up until you discover the perfect combination of choice words and phrasing that makes people’s eyes bug out when you give it. When that happens, you’ll know you’ve got it right. Seriously, I know how challenging it is to communicate need to other people in a way that stops them in their tracks. My son, Christian, and I have developed an entirely new way to do this through the art and science of documentary videos. We turned to this medium because we both recognized that the world has embraced video communications as a preferred way of acquiring information. Just look at the success of YouTube! In one of my later blogs, I’ll expand on the benefits of using this new way to share your case for support. The point is, you never get a second chance at a first impression. My son and I help fundraisers make the best possible first impression with the introduction of their case statement. Yet one thing never changes—fundraising is ultimately a people-to-people business. So no matter how many tools you acquire to assist you in telling your story, you still have to be able to speak your truth, face-to-face, one person at a time. If you are struggling right NOW with this challenge, and the urgency of your own efforts to define need seem overwhelming, you may require a little nudge in the right direction. If you think I can help, drop me an email and share your problem as you see it. Let’s see if we can get you on track again and moving forward.